NEW YORK (AP) The Toronto Raptors reached 50 wins for the third straight season. DeMar DeRozan and Kyle Lowry are seeking much more. 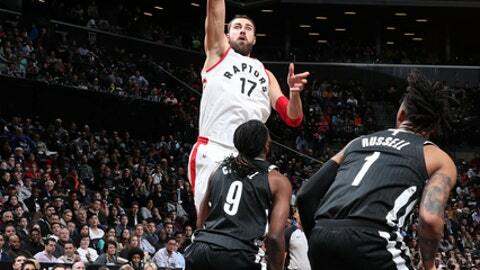 Jonas Valanciunas had 26 points and 14 rebounds, and the Raptors won their ninth straight and 16th of 17, 116-102 over the Brooklyn Nets on Tuesday night. DeRozan and reserve guard Fred VanVleet each scored 15 points, and Lowry added 11 points and 11 assists for the Raptors, who held Brooklyn to 35 points after halftime and won a franchise record-tying seventh straight road game. Toronto increased its lead in the East over the Boston Celtics, who were off Tuesday, to four games with the start of the playoffs just a month away. D’Angelo Russell hit his first seven shots – all 3-pointers – and scored 24 points in the first quarter for the Nets, who have lost 11 straight to the Raptors. The Nets point guard was subbed out with 4:20 remaining in the period and managed to make just 3 of 14 from the field the rest of the way. He finished with 32 points, and Rondae Hollis-Jefferson scored 19. Despite owning the league’s third-best overall record, the Raptors have struggled coming out of the gate this season, and trailed 74-59 after Dante Cunningham’s tip-in layup in the opening minutes of the second half. But Toronto went on a 15-0 run, capped by VanVleet’s 3-pointer that made it 74-all with 6:04 left in the third quarter. The teams traded baskets the rest of the period. In the fourth, CJ Miles led a 14-4 run with three 3-pointers, his last one extending Toronto’s lead 103-95 with 7:15 left. Miles finished with 12 points. Brooklyn got within 103-100 with 5:48 remaining. The Raptors shut the Nets down the rest of the way, setting up DeRozan’s streak of seven straight points that increased the lead to 110-100 with 2:27 to play. Raptors: Also won seven consecutive games away from Air Canada Centre from Nov. 23 to Dec. 26, 2006. … Have scored at least 100 points in in a franchise record-tying 20 straight games. Toronto reached the century mark in 20 straight during the 2009-10 season. … Delon Wright scored 10 points, one of six Raptors in double figures. Nets: According to the Elias Sports Bureau, Russell’s 24 points in the first quarter were the most by a Net in the opening period since Vince Carter’s 24 on Apr. 4, 2005, against Boston. … Brooklyn tallied 40 points in the first quarter, tying a Barclays Center mark set on Nov. 18, 2013, against Portland. Right before Casey headed out to Los Angeles for the All-Star Game along with Lowry and DeRozan, the Raptors coach got his group together to stress how important it was to nail down the top spot in the East. He just won’t do it at the expense of his two All-Stars. ”Deep down I would be lying if I said it’s not important. It is important. I mean, it’s important for our franchise, where we come from, where we’re trying to go to, what we’re trying to accomplish to get that No. 1 seed, whatever it is,” Casey said. Raptors: Continue their trip at Indiana on Thursday. Nets: At Philadelphia on Friday.